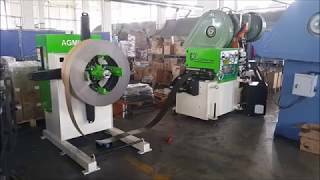 RM750M Mechanical Decoiler is designed to work with 750 Kg Coil with width of 300 mm and thickness 3mm. 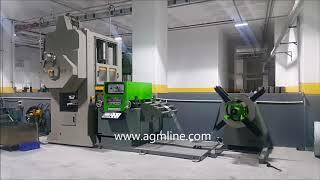 RM750M is motorized and speed controlled model Decoiler which includes an inverter for smooth start-up and stop. Start and Stop functions are automatically controlled by Proximity Sensor. 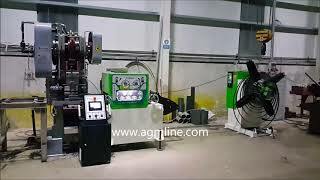 Mechanical Mandrel Opening System works manually by operator control during inner tightening and loosing. Speed Control System is controlled by frequency inverter and acceleration is adjustable. Loop Control is enabled by distance reader sensor which is also adjustable. Forward and backward rotation can be controlled both manually and automatically. Snubber Arm is an option which prevents uncontrolled uncoiling. The Decoiler speed is more than 12 rpm. Snubber Arm system is used to prevent the spreading of sheet metal. 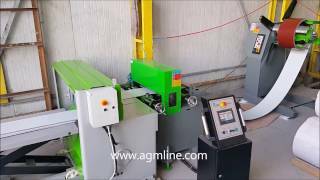 Standart Specifications of RM750M Model Motorized Decoiler.